On the side of Bush House, Elm Grove, Southsea. Doctor Arthur Conan Doyle M.D. 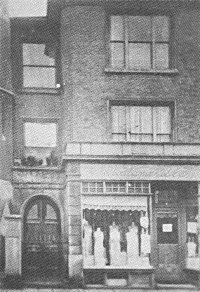 which formerly stood on this site. Sherlock Holmes novels were written. 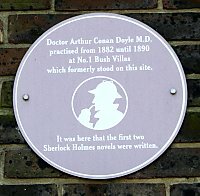 Arthur Conan Doyle began his professional career as a GP at No. 1 Bush Villas in the summer of 1882. He had arrived in Portsmouth in the June of that year, from Plymouth, with no job, nowhere to live and little more than £10 to his name. While he lived in Portsmouth, Conan Doyle threw himself into the life of the City. He joined the local Portsmouth Literary and Scientific Society, gave numerous speeches on topics of the day, and played for the local cricket and bowls teams, as well as being the first goalkeeper for what is now Portsmouth Football Club. He also began a second career, writing successful novels including Micah Clarke and The White Company, as well as the first two Sherlock Holmes novels, A Study in Scarlet and The Sign of Four. Portsmouth was, in this sense, the birthplace of the world's greatest fictional detective. By the time Arthur Conan Doyle left Portsmouth he had proved himself to be a great friend to many Portsmouth residents, an active local sportsman, and a successful and valued doctor. He had discovered spiritualism, become a father, and created one of the most famous literary figures the world has ever known. It is little wonder that he remembered the City with such great fondness for the rest of his life. 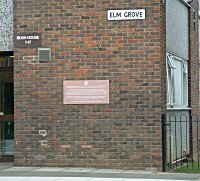 The original rectangular plaque doesn't mention the reason it is sited on a rather undistinguished block of flats. For this reason the circular plaque was added at a later date. Although this block of flats is called Bush House, it did not simply replace the earlier building of that name as the Elm Grove area has since been utterly transformed, mainly due to heavy bombing in WW2. Nowadays there is little to indicate that the junction of Elm Grove, Kings Road, Castle Road and Green Road was one of the most significant in Southsea, nor that the Elm Grove and Kings Road have been 'straightened' whilst Castle Road has been given a bend such that it longer forms a crossroad with Green Road. Photos 3 and 4 (see left) from c1900 shows Bush Villas and the road junction as Doyle would have known it. The large building on the right is the Bush Hotel, whilst behind it, sandwiched between the hotel and the church, is Bush Villas). 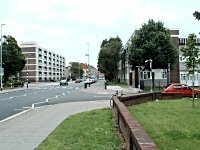 The image from 2007 is taken from a similar place and clearly shows the straightening of the main road and the marginalisation of Castle Road and Green Road. Portsmouth City Museum, a few hundred yards from this plaque, now houses the world's most extensive collection of Conan Doyle artefacts, thanks to the Richard Lancelyn Green Bequest.